July 2014—Mary Gillis knows a good thing when she sees it. Mary’s sister Eileen had been planning a kitchen renovation for some time. Part of her kitchen ceiling had caved in, making the project more imperative. But Eileen lives in Washington, DC, and the cabinets were here in Boston. This Reuse Center cabinet set caught Mary Gillis's eye. 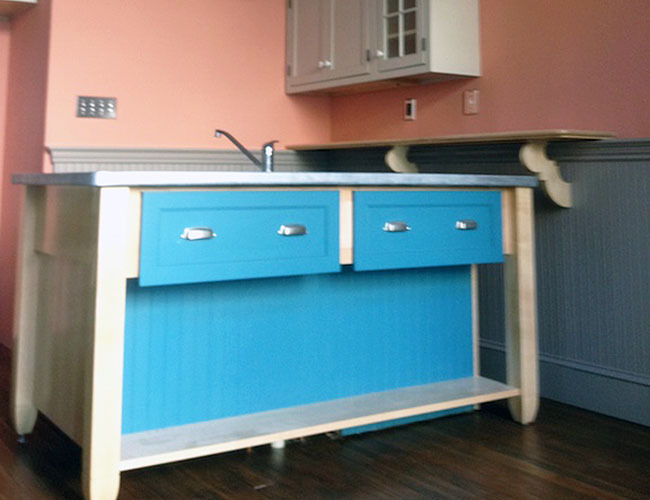 She knew they would be great for her sister Eileen's kitchen. The traditional cabinet style matches the home's architecture. The kitchen has a warm, "grandmotherly" feel. 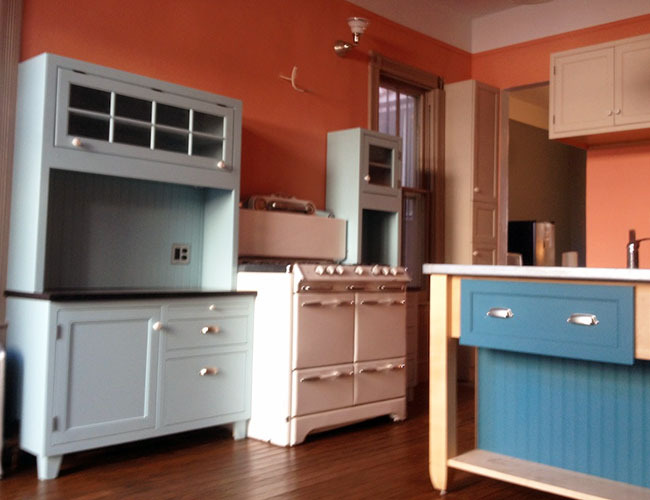 Different paint colors were used on subsets of cabinets. The large cabinet set included about 16 linear feet of base cabinets and 16 linear feet of wall cabinets, so there was a lot of flexibility to reconfigure and rearrange the set in a way that worked in the new setting. One of the most creative twists was turning a wall cabinet with glass doors on its side to become the top of a Hoosier cabinet (freestanding hutch-like cupboard). The renovations gave the moderate-sized kitchen a more open layout. When she visited, Mary found it to be “an incredibly comfortable kitchen that feels like a visit to your grandmother’s house.” The cabinets were painted in different colors when used for an island, Hoosier cabinets, and traditionally installed. 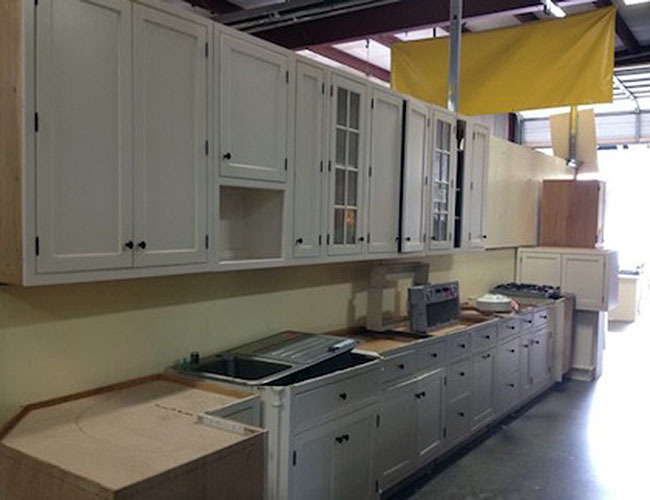 For a cost of $3,000 for the cabinet set, plus $1,000 for a freight company to truck them to Washington, she was able to leverage what “looked like $25,000 or more worth of cabinets,” said Mary. Even with the cost of the carpenter’s extra work to adapt the cabinets to their new setting, they came out way ahead financially and are now enjoying a kitchen they love.